This list, first presented at the 2013 The Downtown We Want event, summarizes over 100 “fine grain” opportunities to get involved in your city. 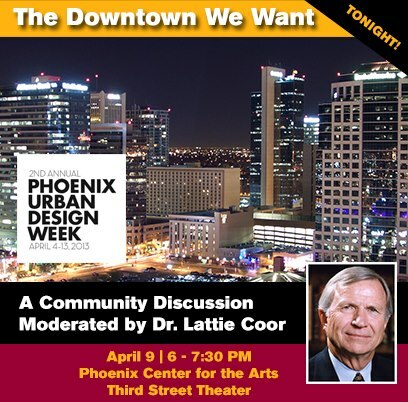 The opportunities are organized by individuals or groups that care passionately about our community, to promote and enhance downtown Phoenix. For the sake of brevity, this list does not include seasons of professional sports teams; seasons of professional arts organizations; themed months; or events, parades, and shopping experiences revolving around major holidays. We invite you to engage in an existing project or encourage you to start something that fills a hole or stakes out new territory. If you live or work outside of downtown Phoenix — in another council district or city across the Valley — we invite you to create a similar list and share it. If you know of something that should be added to the list, please write to us here and we’ll add to the next printing. We look forward to meeting you and seeing you at an event downtown. Thank you for all you do for downtown Phoenix! –Welcome to Phoenix, a culture-building project by Jim McPherson & Lindsay Kinkade.